Three pedestrians were killed in separate crashes in Manhattan and Brooklyn last night. At around 7:50 p.m., 85-year-old Richard Griffin was on his way to visit a hospital patient, according to the Post, when he was apparently struck head-on by the driver of a Jeep SUV on York Avenue at E. 69th Street. Griffin, of Staten Island, was taken to Cornell Medical Center and died soon after. At approximately 11:30, Gerald Green was hit by the driver of a Jeep SUV while attempting to negotiate the hellish intersection of Linden Boulvard and Rockaway Parkway. Here’s how the crash was described by DNAinfo and the Daily News. Green, who cops said was crossing against the light, was taken to Brookdale University Hospital and Medical Center and pronounced dead, police said. 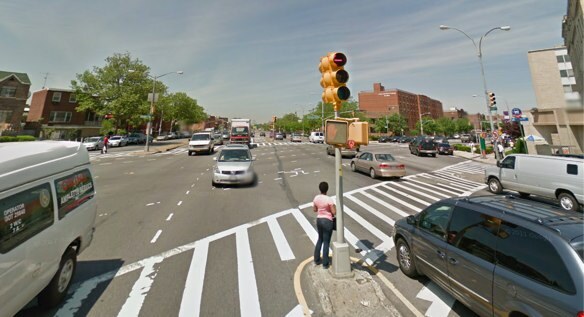 Gerald Green, 52, was hit in East Flatbush as he tried to cross … against the light … cops said. The Daily News story reported that another pedestrian was killed, in Harlem, some 90 minutes later. According to NYPD, a 35-year-old man was crossing W. 125th Street at Broadway when he was hit by a yellow cab driver at around 1 a.m. He was pronounced dead on arrival at St. Luke’s-Roosevelt. Police had not released the victim’s identity as of early this afternoon. No drivers were charged for any of these crashes, despite the fact that there is no indication that the fallen Harlem pedestrian or Richard Griffin were violating any traffic rules. That’s because NYPD tends to cite possible causal factors — who “had the light,” for example — only when they are attributed to the victim, i.e. the dead or wounded pedestrian or cyclist. Even when details emerge that a driver was speeding or ran a stop sign, most often such information comes from witnesses, and is rarely followed by charges against the driver. In other words, though 60 percent of fatal pedestrian and bicyclist crashes with known causes result from drivers breaking the law, as far as police and, usually, the city press corps are concerned, most crashes are either the victim’s fault or acts of God. Cases in which motorists are viewed as anything other than unwitting players in someone else’s tragedy are few and far between. The fatal Harlem crash occurred in the 26th Precinct, and in the City Council district represented by Robert Jackson. The crash that killed Gerald Green happened in the 67th Precinct. Green is the second pedestrian to die at the hands of a motorist in Charles Barron’s council district in less than a week. Richard Griffin was killed in the 19th Precinct, and in Jessica Lappin’s City Council district. The NYPD won’t do anything, because they’re run by a criminal who doesn’t care about following the law. A grand jury could indict Ray Kelly — there’s some state crime which is defined as public officials refusing to provide public services — and some progress might be made if that happens. I don’t see how else to make progress. Perhaps Lappin is on to something. She would be the tragic character, truly wanting no pedestrians to be killed even as she acts to perpetuate the auto-dominated street conditions that kill us. That or she is mouthing empty clichés intended to connect emotionally while promising nothing and keeping her political options open. The driver who took the life of Mr. Gerald Green needs to have a private meeting with Mr. Greens family ans his six year old son to explain exactly what happened. A dead man cannot speak for himself and shouldn’t be blamed for his own death because he wasn’t the one driving the vehicle. But the bottom line is that Mr.Green family needs closure and only the driver of that SUV could explain what Gerald’s last seconds were like. Rest in peace Mr.Green. So sorry you had to leave like you did and so soon. Thanks for everything. The thirty five yr old is Darrell Sharper husband, father of two small children, working for the MTA, as a bus operator. The 35 year old victim is my husband Darryl Sharper. Our family is devastated by this loss. Its crazy to know that killing someone while speeding is not enough for you to get arrested or having charges filed. smh. God will deal with the drive.